[ACT](VC):COST [Discard cards with the sum of their grades being 3 or greater from your hand], search your deck for a grade 4 card, ride it as [Stand], shuffle your deck, and at the end of this turn, retire that unit, and ride a grade 3 card from your soul as [Rest]. 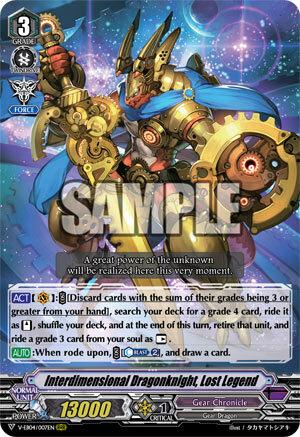 [AUTO]:When rode upon, COST [Counter Blast (2)], and draw a card. So we get Stride for V gear Chronicle except not really. Rather luckily his +1 draw is balanced by the fact few other things in this deck even use CB at all, and gaining a Force Gift every time you de-evolve from Grade 4 to 3 is neat enough for big numbers. What’s less cool is the fact that Grade 4s at big amounts is mandatory. You COULD get away with only Lost Legend as the Grade 3, as long as Memenne and Wedge Move Dragon are run at decently high amounts, but ew at the thought of less consistent riding. But all the same it bypasses ZANBAKU which is a good point in its favour. He works though, and at least you know what you’re getting for your costs.